Well, while I agree it is important to have protein in your diet, there are two things to know. 1. We really DON’T NEED as much protein as most people think. 2. It’s actually quite EASY to get all the protein you need from a plant-based diet. It’s amazing how many people are concerned about a lack of protein, but in our Western culture, almost NO ONE needs to worry about suffering from a lack of protein. We’ve been brainwashed by supplement companies and magazine ads into thinking we need one gram of protein per pound of bodyweight, but science has NEVER shown that level of protein intake to be needed. In fact, what we really see is people eating excessive amounts of protein and sometimes so much that they get fat and very ill! Like I said, getting enough protein has not been a concern in our country, we see very few cases of protein deficiencies and the few cases typically are in poverty stricken areas. Typically in this situation there is an overall deficiency of calories and most nutrients not just a lack of protein. But as long as you follow a whole food meal plan giving you at least 1600 calories, you will easily get enough protein. According to the World Health Organization (W.H.O) you need to consume a minimum of 10% of your daily caloric intake from protein to be healthy and build lean muscle. The World Health Organization is the leading authority on human health and is dedicated to improving the quality of people’s lives around the world. The only places the W.H.O discovered minor protein deficiencies were in underdeveloped countries that did not have access to a variety of foods and protein and consequently these people had a lack of over all nutrients not just protein. The W.H.O is attempting to deliver more legumes to these areas to balance their diet and insure they get enough protein. Countries that eat a sufficient amount of calories and variety don’t see protein deficiencies. A variety of foods everyday is what will give you a well balanced diet. 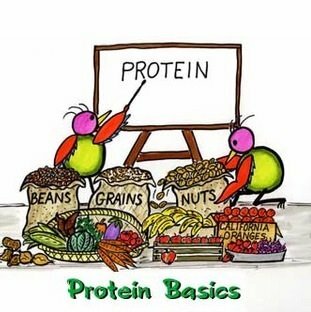 Let’s take a look at an EXAMPLE as we review protein needs. As I mentioned in the above paragraphs, the recommended amount of protein for a vegetarian is a minimum of 10% of your daily calories. If you are eating a 1,600 calorie diet, 10% of that would be 160 calories. Each gram of protein has 4 calories, so that calculates out to 40 grams of protein per day. This is easy to do! All you need to do is eat a ½ cup of lentils you are getting about 10 grams of protein and a hard boiled egg has 7 grams of protein. You are 1/3 of the way there! Of course, it’s still easy to do if you are vegan. Oatmeal has about 7 grams of protein per serving, hemp bliss has 5 grams of protein per cup, and quinoa and spelt pasta have 10-15 grams of protein per serving. Here’s another way to determine how much protein you’ll need. The recommended amount of protein is 0.49 grams per pound of bodyweight (NOT 1 gram of protein per pound of bodyweight like steroid-using bodybuilders suggest). You can also determine your minimum amount by taking your bodyweight and multiplying it by .49. Example- If you weigh 130 pounds x .49 = 63.7 grams of protein. However, if you are overweight and use this formula, you will dramatically OVER-estimate your protein needs. Therefore, you can use your target weight when doing this calculation. So if you are 160 pounds but want to be 130 pounds, just use the 130 pound target weight in the calculation. These 2 methods give you slightly different amounts of protein so you can see there is NO EXACT MEASURE but at least gets us in the minimum acceptable range. For our purpose of weight loss I have found that up to 20% of your daily calories from protein will help you increase your metabolism, curb your appetite, and help you build lean muscle. But you don’t need more than that. Thank you! I was just NOT convinced that non-meat does not have everything we humans need. I would comment again if I find new info related to this! I’m glad I could show you what a great thing a veggie diet can be! It offers such great benefits and can give you all the nutrients you need as long as you chose the right foods! You don’t seem to practice what you preach. I downloaded you 7 day sample diet and it seems to rely on expensive overly processed protein powders once or twice a day.